You can vary the vegetables and herbs in this puff pastry tart according to what you have. Leave yourself an extra hour preparation so that the pastry has time to rest. Using a sharp knife, trim the sheet of puff pastry to 25 x 28cm/10 x 11in. Place it on a baking tray lined with baking parchment and score a border 2cm/¾in in from the edge all the way round. Prick the pastry within the margin, using a fork. Leave to rest in the fridge for about an hour. Meanwhile, preheat the oven to 240C/220C Fan/Gas 9. Put the courgettes, pepper and red onion into a large bowl. Add the garlic and herbs and season generously with salt and pepper. Line a large baking tray with baking parchment, lay the vegetables on it and spray 15–20 times with oil. Brush the puff pastry all over with the milk and sprinkle with a little salt. Cook on the middle shelf of the oven, with the vegetable tray on the top shelf above, for 15 minutes, rotating both trays halfway through to ensure even colouring. Remove both trays from the oven and reduce the temperature to 160C/140C Fan/Gas 3. Set the vegetables aside. Press the inside of the pastry down and return to the oven for 25 minutes to get a super-crisp base. Take the tart case out of the oven and increase the temperature to 200C/180C Fan/Gas 6. 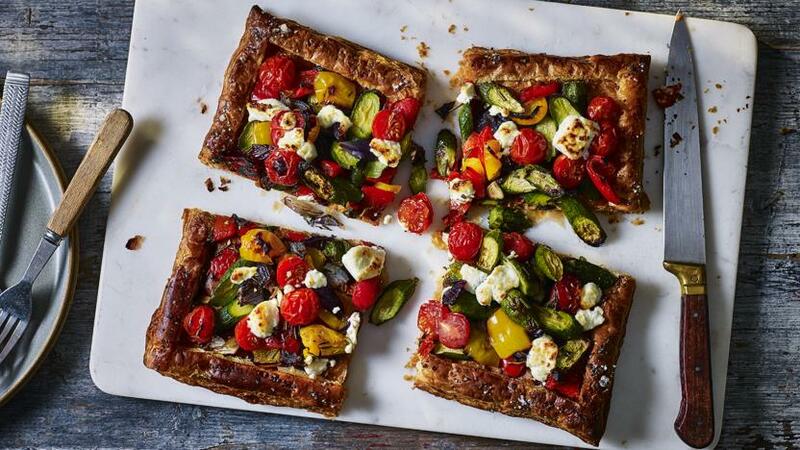 Tip the roasted vegetables into the tart case, scatter over the cherry tomatoes and goats’ cheese and season with salt and pepper. Bake for 20–25 minutes until the vegetables are cooked through and the cheese is softening and colouring at the edges. Cut the tart into quarters and serve.